DARTMOUTH, Mass. 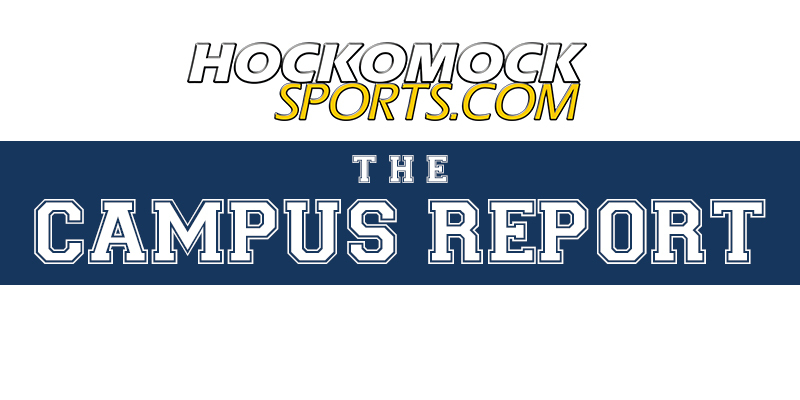 – In a back and forth battle that featured two heavyweights that featured four fourth quarter touchdowns, each side matching each other punch for counter punch, a special teams play in the second quarter may have been the biggest difference in the game. 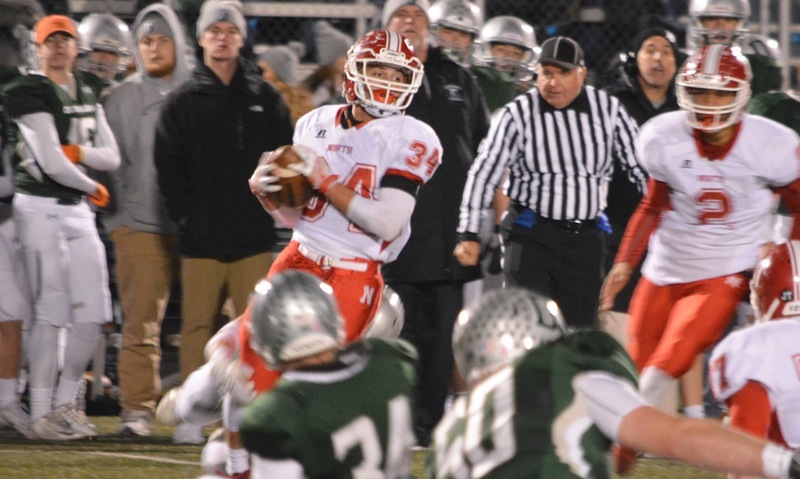 North Attleboro emerged from the thrilling contest as 37-27 winners over Dartmouth in the D2 South Semifinal, snapping the home team’s 16-game win streak (longest in the state) and handed the Indians their first loss of the season. While the fireworks were saved for the fourth quarter, arguably the biggest play came late in the second quarter. Dartmouth’s Liam Caulfield intercepted a tipped pass and brought it back 65 yards. A play later, QB Cole Jacobsen hit Caulfield for a 15 yard score, bringing the Indians within a point with less than two minutes to play in the first half. On the extra point, North Attleboro senior Jack Dakin came flying in untouched and blocked the kick. Two bounces later, Rocketeer senior Neal Doherty scooped the ball up and sprinted 75 yards for two points for Big Read. Instead of a tie game at halftime, the Rocketeers held a 16-13 edge. The three point difference proved pivotal in the fourth quarter shootout. 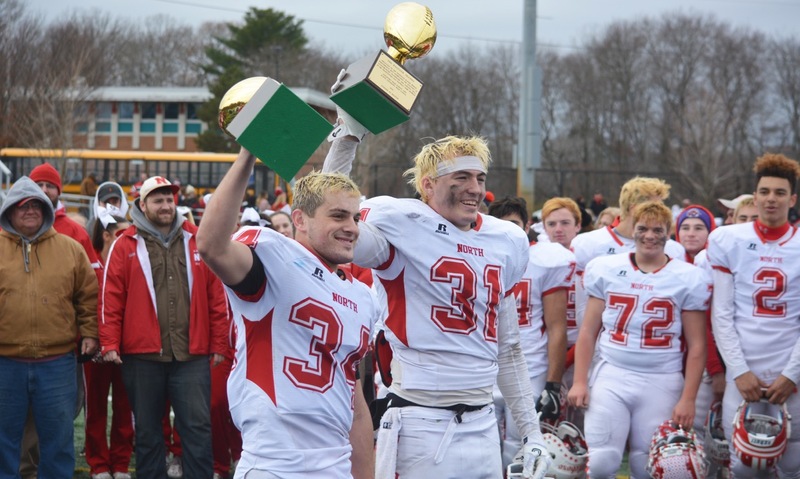 “I thought it was huge at the time,” North Attleboro head coach Don Johnson said. “The thing is we should have blocked more. We worked on it, we were confident we could get one and we got one, but we wanted more of them. The first half saw each team have a lead – Dartmouth striking first before North responded with two straight scores. Both teams turned it over on the opening possession and the Indians used a trick play – wide receiver Nate Ellis hitting fellow wideout Miles Linhares for a 75 yard touchdown. North responded with a methodical 10-play drive that covered 78 yards, Nick Rajotte (16 carries, 113 yards, 3 touchdowns) capping it with a 2 yard run to tie the game 7-7. It took less than two minutes of time in the second quarter for the Rocketeers to seize the lead. On 2nd down, North junior QB Chad Peterson (11/18, 166 yards, 2 touchdowns) delivered a perfect lofted strike down the left sidelines and senior Hacmoni Cuevas hauled it in over his shoulders and scampered in the last five yards for a 44 yard touchdown. “I think the real key was our offense being able to move the ball,” Johnson said. I don’t know how many snaps they had compared to us, until the end there. I thought us moving the football on offense kept their offense off the field and that was a big factor. North had a chance to add to its lead before halftime but Dartmouth’s Luke Clarke grabbed his second interception of the game, picking off Peterson in the end zone midway through the second quarter. To start the second quarter, North not only had a 16-13 lead thanks to Dakin and Doherty, they opened with possession — and made the most of it. The Rocketeers used nearly eight minutes of the third quarter to march 61 yards on 15 plays – going 4/4 on third down – to increase the lead to double digits. Despite a pair of holding calls early in the drive, the Rocketeers were still able to move the ball — Peterson hitting Kyle McCarthy (3 catches, 64 yards; 10 carries, 86 yard) for 13 yards over the middle to convert the first third down. Facing another third down, Peterson kept it on the option for a five yard gain for another first. Rajotte converted the third third down of the drive, plunging for six yards. Bobby Mylod (10 carries, 51 yards; 4 catches, 29 yards) nearly got into the end zone on the fourth third down but it was enough to move the sticks. On the next play, Rajotte darted in for a touchdown; Devin Slaney (5/5 XP) split the uprights to make it 23-13 with 3:05 left in the third quarter. The final quarter was completely back and forth, with Dartmouth getting within three on two occasions, but never tied the game — all tying back to Dakin’s block and Doherty’s return. With 8:55 left in the game, Jacobsen connected with Ellis on a comeback but North’s defensive back slipped and Ellis ran his way to a 37 yard touchdown to make it 23-20. North responded, again converting a pair of key third downs to get into the end zone. The Rocketeers were faced with 3rd and 5 from their own 49. Instead of keeping it on the ground, Big Red went play action and Peterson aired one out deep where McCarthy hauled it in for a 45 yard completion after getting a step on the defense. Three plays later, facing third and goal, Peterson used play action again to fool the Indians and connected with a wide-open Mylod on the right side for a score and a 30-20 lead with 5:33 left. Dartmouth used a 24 yard completion and 15 yard penalty to quickly move back up the field. On second and goal, Jacobsen tossed a perfectly timed pass to find a diving Ellis near the sideline for an 11 yard touchdown with 3:28 to go, drawing Dartmouth within 30-27. The Indians elected for an onside kick on the ensuing kick off and the ball did bounce free for a moment but David Engler quickly smothered it. 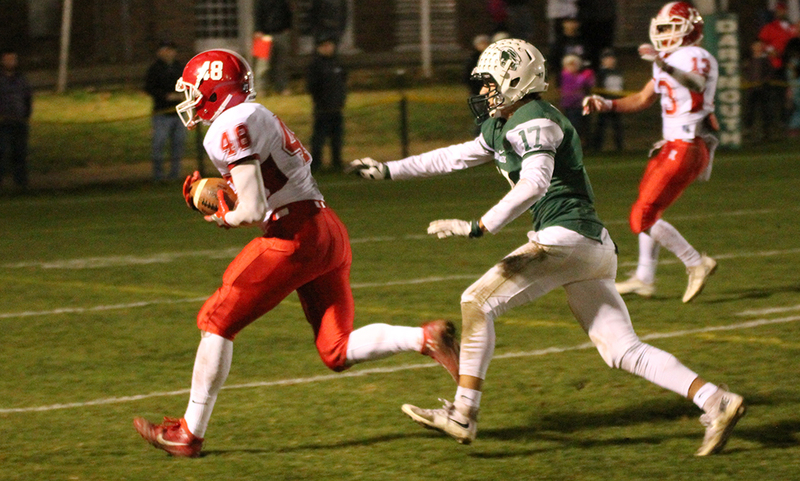 North Attleboro attempted to run the clock out but Dartmouth had four timeouts to burn, helping keep North in check. Fittingly, on another third down, the Rocketeers were able to put the game away. Facing third and four from midfield, Rajotte got to the outside on the left sideline, found a seam and burst through it, racing to the end zone for a 37-27 lead with 2:50 to go. “Going through my head, I knew I needed to get four yards,” Rajotte said. “It was 3rd and four, it was a huge spot in the game for us, we were up by a little bit. A first down at that point was going to be huge for us. During the play, I was just patient. The outside linebackers had been blitzing all game, luckily we had some great blocking on the play. The Rocketeers defense was finally able to stop Dartmouth on its ensuing drive to end the game. While Jacobsen was able to find success through the air, his normal game includes a lot of running – which the Rocketeers limited. Dartmouth finished with just 51 yards rushing as a team. North Attleboro football (8-1) advances to the D2 South Final to play #1 Duxbury (9-0). The Dragons used two fourth quarter touchdowns to beat Stoughton, 35-21, to reach the final. 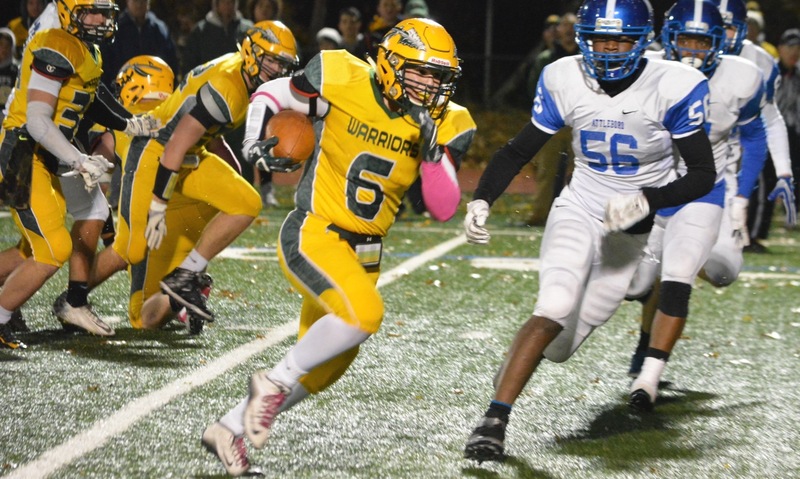 The game is currently scheduled for Friday night at Duxbury High with a 7:00PM kickoff.